Even though it’s not possible to sprout antlers in a few minutes, the zoo posted a video of Napoleon, our male bull elk, doing just that! 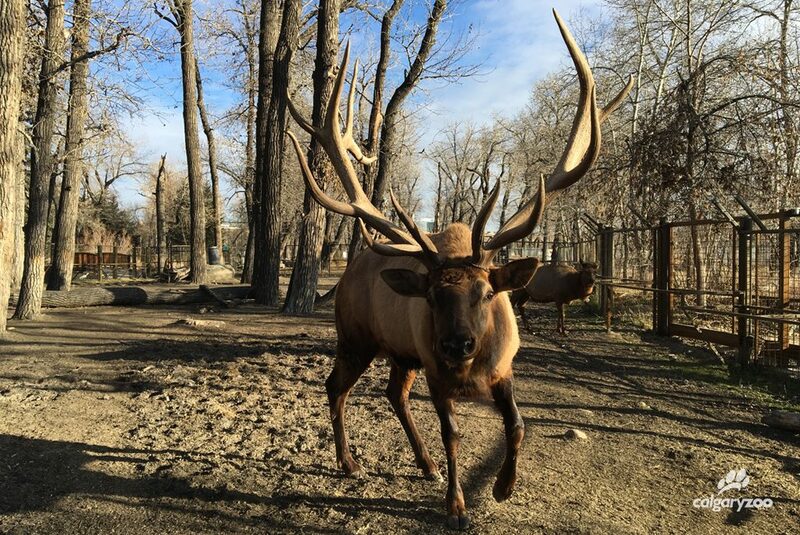 Zookeepers Michelle Benzen, Scott Russell, Christina Brunner, Alex Phillips, Matt Emrich spent the better part of a year snapping pictures of the beautiful elk as he grew a new rack. Zoo fans wanted to know more after the video was posted- like how long it took for them to grow. Do they hurt? How heavy are they? Keeper Michelle Benzen has the answers below! Q: How often does Napoleon grow antlers? A: Napoleon grows a new set of antlers annually. Q: How long does it take for them to grow, from the time he drops the last set, to when they’re full? A: Antler development begins immediately after the former antlers has dropped, which occurs in late winter or early spring. The timing of antlers drop is largely affected by hormones (testosterone), which are actually regulated by the amount of light per day. It is also impacted by factors such as age and diet (quality and quantity of food) of each individual where older age and/or poor nutrition can lead to an earlier drop. Each new antler begins to grow from an attachment point on the skull called the pedicle, and growth occurs at the tip. The bull elk Napoleon a day after he dropped his last set of antlers. Did you know that the antlers are not hard during development? They begin as cartilage, and are covered with highly vascular skin, commonly called velvet! The velvet is rich in oxygen and nutrients which allow for the rapid growth of the antlers. The velvet will eventually be rubbed off and shed, indicating the antlers are fully grown. At that point there is no longer blood flow to the bone, so they mineralize and die; the dead bone structure is the sign of a mature antler. This velvet process typically takes a few days to a week and occurs from July to early September. The entire process from antler shed to full mature bone antler takes approximately half a year. Last year Napoleon dropped both his antlers the morning of March 5, 2016. By August 8 his velvet shed had begun which only took a few days to reveal his mature antlers on August 12. Q: Does he grow a bigger rack every year? How heavy are they? A: The size of an individual’s antlers is related to their age and diet. Male calves will form small 2-3cm “buttons” and yearlings will typically grow a spike. Typically the first set of antlers are formed when a male is two years old and they are generally small with only a few points (or tines). A full month after his drop, Napoleon is beginning his new rack. The antlers will continue to grow over several years until they reach a maximize size as a bull matures. Generally, the largest antlers are grown by bulls between the age of 7-10 and typical have six points. However, if an individual is nutritionally stressed they will likely experience a decrease in antler growth during that cycle. After a bull is past his prime years his antler size will decrease over time. Napoleon himself has a very large rack by any standard and over the past few years has developed seven points on each antler. 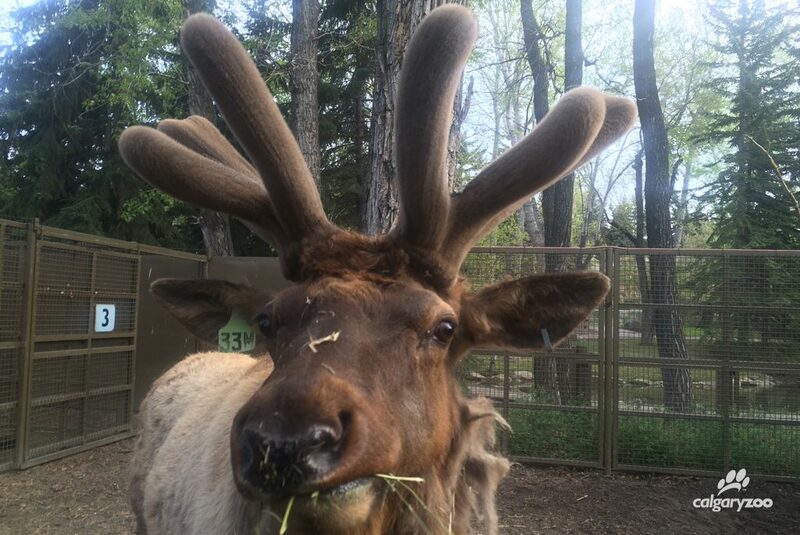 He will turn 15 this spring, so he is maintaining prime (and magnificent) antler size as a result of a few factors including his access to high quality food resources year round. On average, for mature bull, one antler weighs between 7.0-15.5kg, so a set of antlers can add up to 31 kg of weight when full grown. Nice work Napoleon! This elk now has developed longer, separate tines- and it’s been just under two months! Q: Does growing them or dropping them hurt? Is there a benefit to him dropping them? A: Napoleon does not experience any pain during the process of growing, dropping the antler, or shedding the antler velvet. During transition times Napoleon may have exposed vascular tissue, which could be sensitive, but is not thought to be the source of any pain. 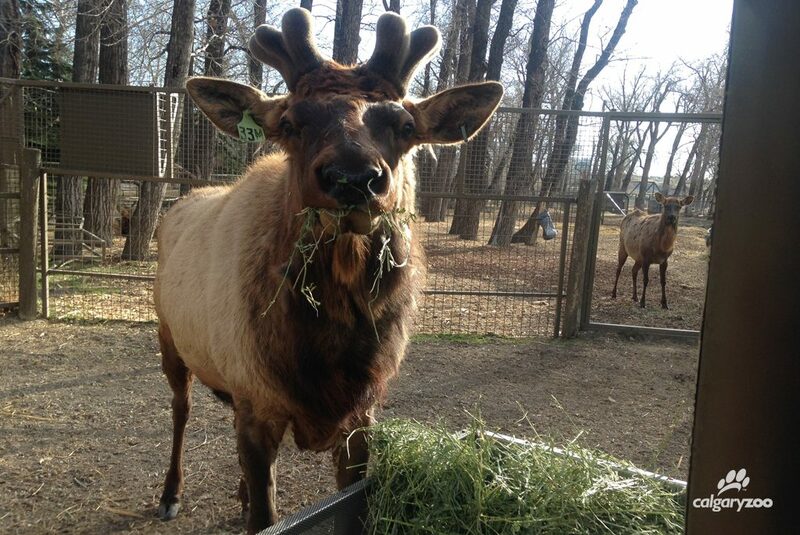 When the velvet begins to shed, Napoleon, like other elk, will rub and thrash his antlers on trees to remove the velvet. He also will try to use his hooves to scratch at the peeling tissue and while this is not painful it can be described as itchy. The keepers snapped this picture on May 28, 2016, almost three full months after be began to grow them. His velvet shed won’t start for another two months. Q: Does he drop them quickly? Does he have to rub them on something or do they fall off on their own? A: Unlike the velvet, in which the Napoleon has to work to rub off, antlers fall off without effort. The elk antler cycle is heavily influenced by the level of testosterone in a male which varies throughout the year. Testosterone is low in the spring and summer months when the antlers are growing at a fast pace. In response to decreasing daylight, the level of testosterone begins to increase later in the summer, slowing the antler growth and initiating the process of velvet shed and mineralization of the bone. The mature antler is then displayed during the fall and winter months when testosterone levels are high and the males are in rut (mating season). When testosterone levels begin to drop again the low hormone level stimulates osteoclasts, a type of cell that eats away at bone tissue. These cells weaken the connection between the pedicle and the antler, at which point becomes so weak it eventually just falls off. 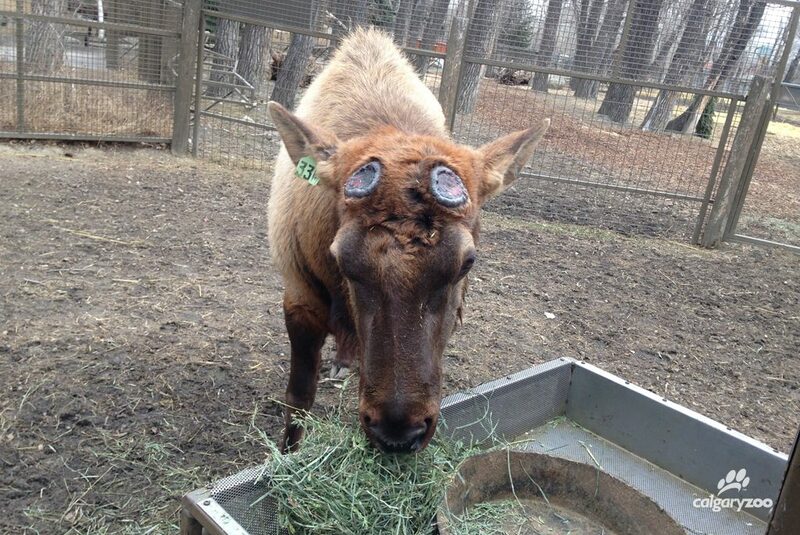 By Nov 28, Napoleon is sporting a gorgeous set of antlers, completely free of velvet. What a gorgeous boy! Q: What does the zoo do with his antlers? 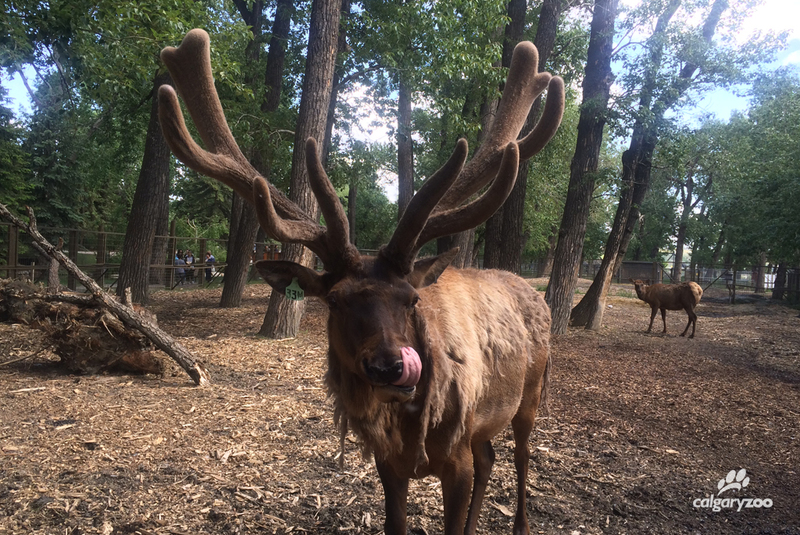 A: The zoo uses Napoleon’s antlers, and the antlers of our mule deer and caribou in a few different ways! Within the Animal Care department, shed antlers and even the shed velvet of the antlers are used as enrichment items for other species. In the Canadian Wilds specifically, antlers are given to carnivores like the wolves and cougars as they would naturally hunt for deer species. They are also put in the enclosures with other animals such as the otters and prairie dogs. In the wild, a variety of animals chew on shed antlers, as the antlers have essential nutrients in them, such as calcium and phosphorus. If you look closely around the zoo’s habitats you are likely to see some old antlers in use, especially in early spring as antlers start to shed! The public also can enjoy the antlers. Our Education department uses the antlers as biofacts in programs, allowing the public to see a variety of these pieces up close and personal. Zookeeper and Education staff at the Calgary Zoo are full of animal knowledge! Learn more at our FREE daily programs, like Keeper and Interpreter talks: DailyVisitor Program Schedule.